When creating your event you probably need to define one or more tickets either for admission, donations, or merchandise. You may need to offer free ticket options or paid ticket options for your event. You may need both. Sometimes you don't need tickets and you really want to use ezEvent® to publicize an event. The good news for you is that ezEvent® can handle any of these cases. The HOW section of the Create Events page is where you can set up these details. The first item to determine is whether or not you will require tickets. In order to define tickets, you must require at least one ticket type. The default option "I will require tickets" is correct for any event with at least one ticket. If you want to publicize an event without issuing tickets, you can "I will not require tickets". This is the only step necessary to complete the HOW section if you are not offering tickets. Your event will list free of charge, and when your attendees register through the checkout process, the checkout will say Registration and the customer need only enter their name. Please note: if you are collecting donations or selling merchandise, these are considered tickets. If you will require tickets to your event, either for free or for sale, leave the default setting "I will require tickets" selected. 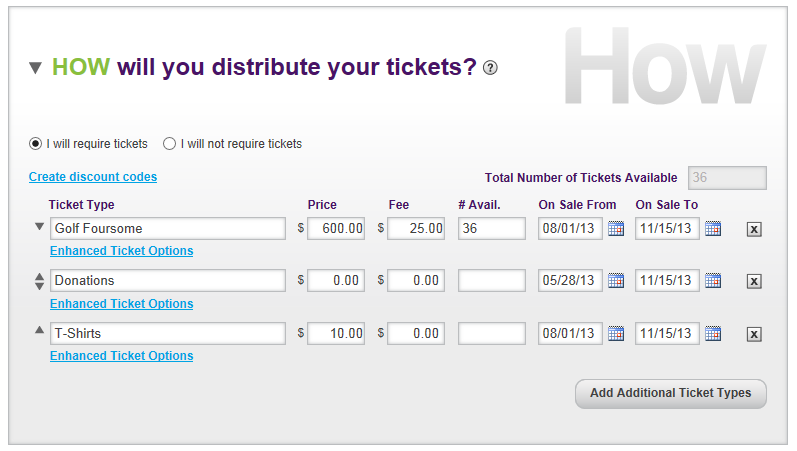 With the "I will require tickets" button selected, you may complete the rest of the HOW section to define your tickets. Price: Enter a price for the ticket in dollars and cents. The amount should be a positive number or 0. Fee: If you are charging a fee for your event tickets you can enter a fixed amount in the Fee area. ezEvent® does not automatically charge you a fee. ezEvent® charges 89¢ per ticket for paid tickets, and only when the tickets sell. For example, let's say you list 100 tickets for sale and 25 tickets for free to one event. If 99 of the 100 paid tickets are purchased and all 25 free tickets are registered, you will be charged the 89¢ fee for only the 99 tickets that sold. You will be charged nothing for the free tickets or unsold ticket. You can pre-emptively pass this fee on to your ticket buyers by entering 0.89 in the Fee box, or you can always charge any ticket price of your choosing. You can also incorporate the 3% Credit Card Fee into the overall price of the per ticket fee to maximize your profitability. In fact, you can enter any amount for each ticket fee, as long as the number is zero or greater. # Avail. : If your venue can only hold 200 people, you don’t want to sell any more tickets than that number. As appropriate for your event, you will enter the maximum number you want to sell of each ticket type in the # Avail. field. The total number of tickets for each type you define will be summed up and displayed in the field labeled Total Number of Tickets Available. This field is located directly below the large "How" image in this section. On Sale From and On Sale To: These are optional entries that enable you to restrict the date the tickets will be available on your event page. You can use the calendars to select the dates or type the dates directly into the fields. Suppose you want to discount the ticket sales before June 1 to $15.00 and after June 1 raise the price to $20.00. You would create at least two ticket types. The first type you might name Early Bird with a price of $15.00 on sale from April 1 to June 1. The second you might name Regular with a price of $20.00 on sale from June 2 to the event date which you may enter. The default start date is the current date and the default end date is the date of your event. You can create as many ticket types as you need. 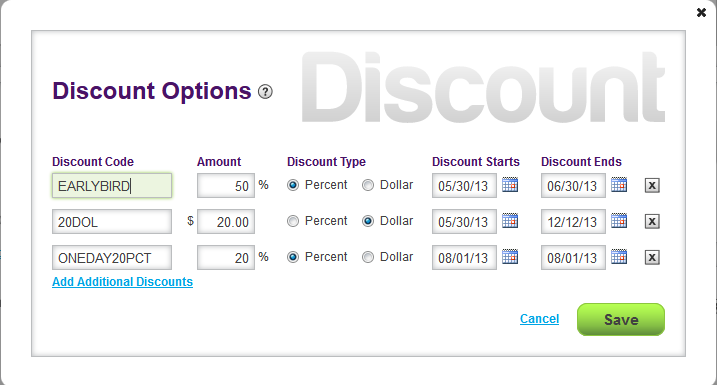 Each can have different prices, fees, on sale dates and options. To create another ticket press the Add Additional Ticket Types button each time you need another ticket. A new blank ticket line will appear below the current line. If you create a ticket type you no longer need you can press the X button on the right side of the ticket type to remove it from your list. Please note that once there has been a sale of a certain ticket type, you can no longer delete this ticket type. Tickets whose on sale dates have passed become invisible in the customer form, and if the number available has been exceeded, the text 'Sold Out' will be displayed in the Tickets Left column. You might want to rearrange your ticket types in a certain way, such as alphabetically, by price, or by on sale dates. If you have two or more tickets, arrows will appear to the left of the Ticket Type. You can then adjust the order of your ticket list with the arrows next to each ticket type. To move a ticket type up the list, click on its corresponding arrow pointing up. To move a ticket type down the list, click on its corresponding arrow pointing down. Clicking on the arrow next to a ticket type will move that ticket type up or down one space in the order. If you have a lot of ticket types this can be especially useful. There are many enhanced ticket options available. 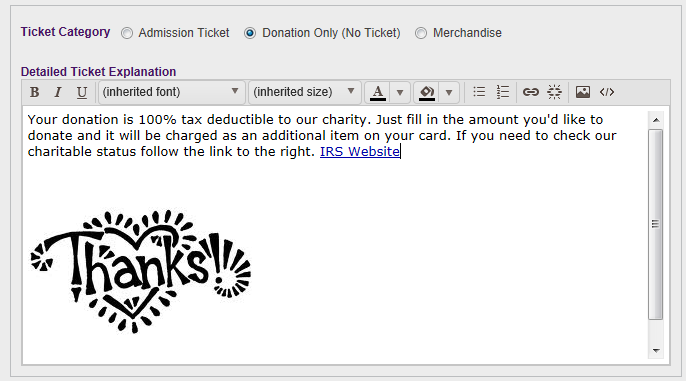 These include the ability to create Donation priced tickets where the customer sets their own price with minimum donation amounts, Donation Only options where the contributor does not receive a ticket, the ability to sell Merchandise & include pictures, a group option where one ticket is for a group of people, a robust Detailed Ticket Explanation, and much more. To display the Enhanced Ticket Option selections for any ticket, click on the Enhanced Ticket options link located below each ticket type. The display opens up a new area where enhanced options are available for that specific ticket type. There are three ticket categories; Admission Tickets, Donation Only (No Ticket), and Merchandise. Each of these can be selected at the top of the enhanced ticket area and each has different options and selections. Admission Tickets allows the selection of several options when you are selling tickets for admission to an event. The first option is a Donation type ticket where buyers set their own price and can buy as many tickets to the event as they want. You can also specify the minimum donation amount per ticket. This will override any price you have set in the main ticket type area for that ticket and the minimum donation amount will replace it. Tickets/Tables/Groups: The next option is Tickets/Tables/Groups. This is useful for several different options. Groups are only used if each ticket purchase during ticket selection and checkout actually buys more than one admission. Common uses for this is a Table of 10 (you would enter 10 in the Number of Tickets in Table/Group/etc. area) or a golf foursome. 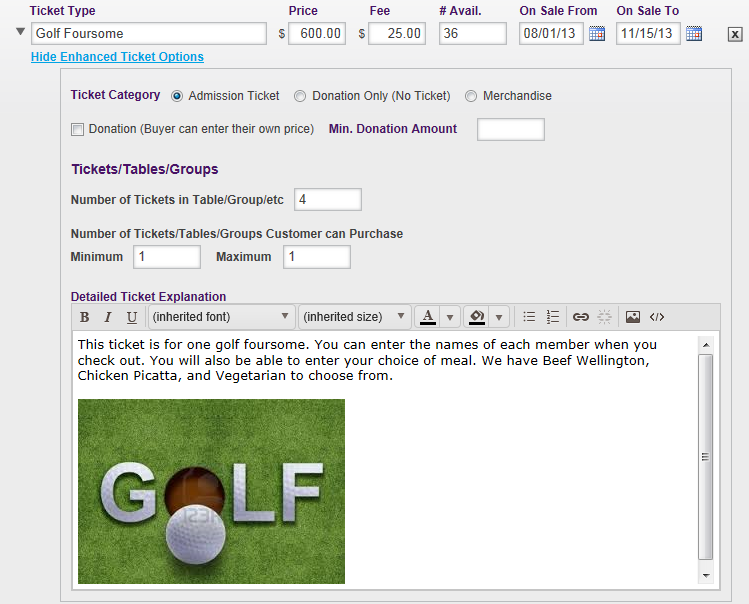 The price you enter in the ticket type area would be for the entire group, and if you are collecting attendee information (See Customize Your Event), it would collect information for the number of attendees that you specified as the group (four for a golf foursome, ten for a Table of 10). The Minimum and Maximum entry areas can be used with or without ticket groups. Suppose you want to limit the number of tickets a customer can purchase to 4. You would enter 1 for the Minimum value and 4 for the Maximum value. Suppose you want to limit the number of foursomes to 1 per customer. You would enter 4 in the Number of Tickets/Tables/Groups entry area and 1 in both the Minimum and Maximum entry areas. Click here to view a sample event that uses group tickets. Detailed Ticket Explanation:The final option is the Detailed Ticket Explanation. In this entry area you can enter text and format it. See Style Event Details for information on formatting this area. The text is displayed below the ticket in the Select Ticket page before checkout. You can adjust the size, color, font, and alignment and add bullets to the text. You can add pictures, YouTube videos, and web links that might be useful if you are selling merchandise or ad space in a program book. You can have a picture of the ad specifications, a picture of your attendee shirt, or even a video explaining the various ticket types or sponsorship levels. If you can think it, ezEvent® can make it happen. Donation Only (No Ticket) is used when you are accepting donations where the buyer receives nothing but a receipt for the donation. The only option available is the Detailed Ticket Explanation. As shown below, there is some text, a web link and a picture. Merchandise is used when you are selling physical items like T-shirts, mugs, posters, or anything other than tickets. 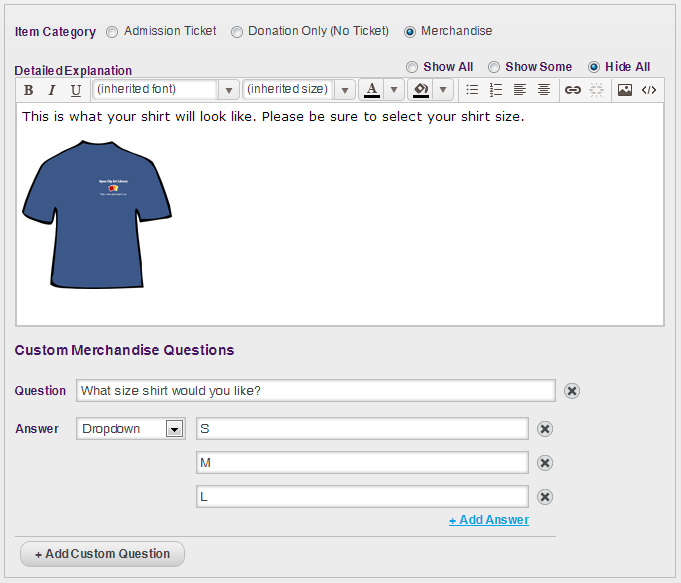 You can use the Custom Merchandise Questions to collect information about size, colors, style, or anything else you may need. You can even collect additional money for larger sizes that will be added to the base rate that you enter for the Price of an item. Click here to view a sample event that uses merchandise. You can enter one or more discount codes to send to potential attendees for a discount on your tickets.